From: 'Richardson's Trading Company is located on Old Route 66 in Gallup, New Mexico. Gallup is a border town to three Native American Reservations. This area is where you will find the majority of these Native American arts and crafts being made. Here at Richardson's Trading Company we strive to protect the Native American artist. Many pieces on the market are manufactured, which only hurts the Native American artist who uses this trade as their livelihood and the traders who promote their work. That is why we will only sell authentic items." Here is a nice and solid watch bracelet. 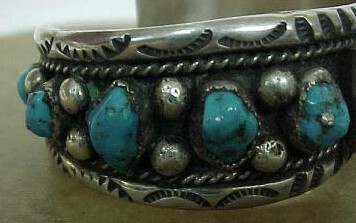 It has five stones on each side of the center. 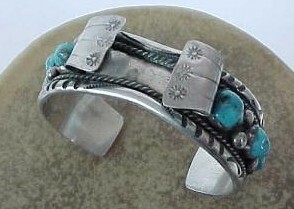 It also has silver additions of large beads, twist rope and reinforcing, hand stamped half round wire. This is a wonderful piece from a deadpawn collection and will be a steal. Native American Artifacts and Crafts for Sale: Page 8: Sterling earrings and beautiful etched Navajo Plate - nice elk! 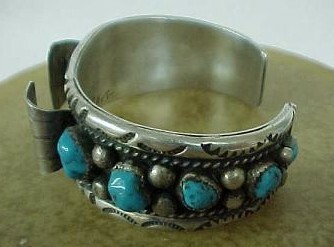 Native American Artifacts and Crafts for sale: Page 10: Tommy Singer Bracelet for sale. Sterling and gold!